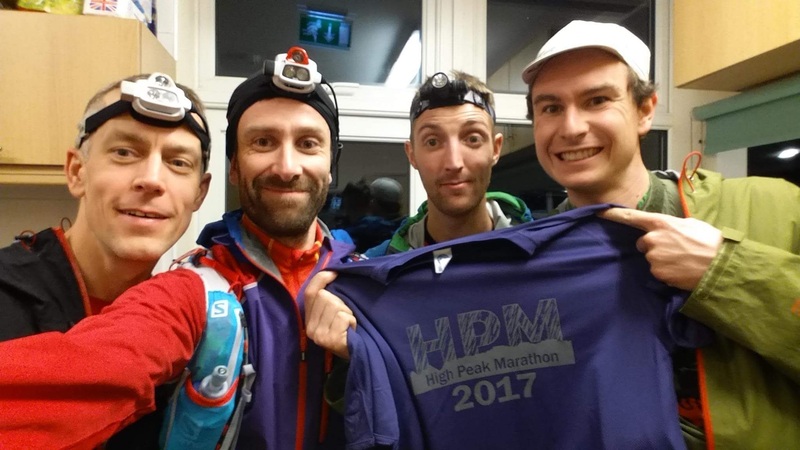 On the night of the race we met up at a packed Edale Village Hall and huddled in a corner near the kitchen. I packed my bag, unpacked, put a layer on, repacked, went to the toilet, unpacked, repacked, went to the toilet, took a layer off, and generally just quietly panicked. I knew I should eat, but I felt quite sick and we hadn’t even started. We set off into the gloom and I thought we were going pretty bloody quickly considering we were planning to be out racing all night. We passed a lot of teams in the first hour and I must admit I wasn’t confident we’d be able to hold them off later on. Hollin’s Cross, Win Hill and Lose Hill were shrouded in thick cloud, but we knew exactly where we were going. The dew drops made it very slippery underfoot and the flagstones were treacherous. It seemed like no time at all before we were on the road up to High Neb and glancing behind us, we could see the scattered beams of bright torchlight snaking their way down the hill. At 1am, it all felt quite exciting but I couldn’t shift the sickness. The first feed station at Moscar came a little sooner than I expected, probably because we were moving so quickly. We stood for little more than a minute, downed some hot squash and snaffled a sausage before making a hasty exit. Leaving the safety of that torchlit, lay-by and heading out into the black emptiness ahead was quite literally a leap in the dark. I knew it would be at least five hours before we would come to another road and I wasn’t sure if I’d make it. I’m sure it was anxiety as much as fatigue but I was feeling more and more sick. I suppose we made good progress along the flagstones past Dovestone Tor, but I was pretty disorientated by the dark and the cloud. At one point I recognised the earings of Nicky Spinks and found myself in awe of her and her team as they trotted past us. We were holding our own though, but I wasn’t sure how long it would last. If I was to choose a word to describe our pace at this point it would have been unsustainable! Thanks to plenty of reconnaissance missions, we took an excellent line across the heather towards Margery Hill. We were relieved to find the checkpoint and headed off across towards Outer Edge. The ground wasn’t at all frozen so each footstep sank into cold Pennine bog. The cloud began to lift and with it, so did my spirits. The terrain made full on running impossible so trotting and marching allowed me to catch my breath. We passed the time with inane Schwarzenegger quotes and occasionally looked back to see scattered groupings of headlights shining wildly behind us. Colin’s navigation through the darkness was arrow straight and I think we took even more places on the slog up towards Swains Head. 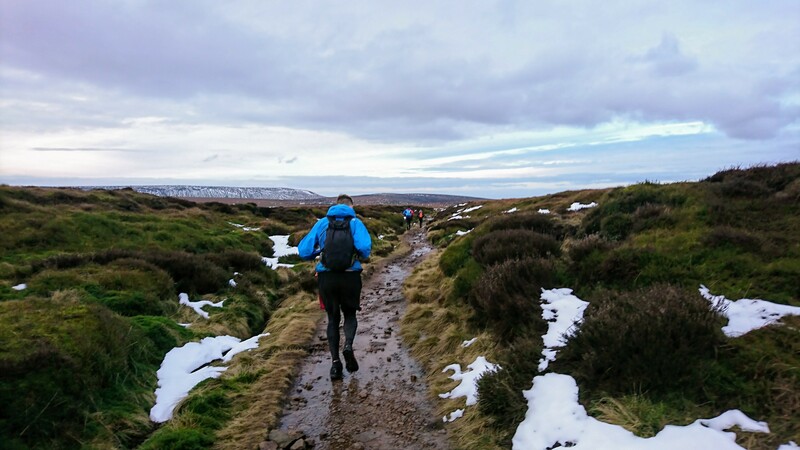 Other less disciplined teams around us appeared trapped in the deep cloughs and misleading ribs of the northern slopes of Bleaklow. We sailed by, past the checkpoint at Bleaklow Stones in time for it to be light enough to finally pocket the headtorches and cold enough to require a thicker hat and gloves. We’d been out for well over eight hours. The icy top of Bleaklow was just disgusting. Dirty snow formed meltwater pools of water so cold it bit at tired toes and splashed burning shins. The temperature of the water in those pools was was the most spiteful part of the race. Too warm to freeze and provide easy passage, cold enough to burn and eventually numb abused feet. I found I lost sensitivity in my feet and started to fall alarmingly often. Splashing in shocking pain. It was a real low point and it seemed to last a long time. Nothing lasts forever though, and I tried to absorb some strength from the eternal energy of Andy and Colin and the cheeriness of the students who were manning the checkpoints. 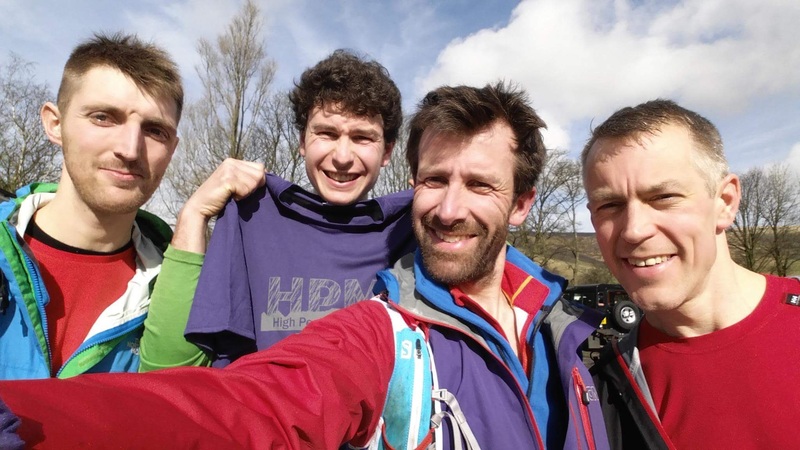 I even managed a smile and a photo as we charged down the Pennine Way back down to Snake Pass and the feed station awaiting us. It was good to be back on a proper path. We set off from the feed station quickly and the fitter runner types in the team (everyone except me) were moving with good form across the slabs up to Mill Hill. I had eaten and drank enough and was warm enough, and I was on a good surface but was still really struggling to keep running. I suppose I was around 30 miles in and I was probably starting to feel tired. The others nursed me up the back of Kinder and after a couple of Jellybabies I started to pick up. We bombed down off Kinder and across Brown Knoll (thank God for those slabs) and saw a few teams ahead of us. It was turning into a beautiful morning and the other teams acted as the carrots that pulled us along. For the first time I felt certain I’d make it to the finish line and I was determined to enjoy the last hour. You can tell I was feeling cheerful as the camera came out again! At Lord’s Seat we realised that we were on for a sub 12 hour time. With Martyn now driving the pace, any hopes I had of gently enjoying the last few miles were rudely shattered. It was a sprint down the hill on battered knees, along the road, pass another team and make it back to the village hall. 14th place team and 11 hours 56 mins.